Save Buffalo Bayou was founded in 2014 to prevent the Harris County Flood Control District or anyone else from bulldozing the forested banks of Buffalo Bayou in and around Memorial Park and the Hogg Bird Sanctuary in the middle of Houston. They were planning to do that, with the support of the City of Houston, the Bayou Preservation Association, and the Memorial Park Conservancy. On April 19, 2017, nearly two years after the close of the second and final public comment period, despite several hundred critical comments opposing the project as well as a petition with more than 3,000 signatures, the Army Corps of Engineers granted the flood control district an exception to the federal Clean Water Act for the project. The initial $6 million cost was doubled to at least $12 million. Taxpayers had already contributed $4 million and would be asked to contribute much more if the project were to go forward. The River Oaks Country Club, which in the meantime installed environmentally-damaging concrete riprap on its banks in two places, was to contribute $2 million. The club owns the entire south bank of the project, much of it riparian forest that until recent decades had been largely undisturbed since the club’s founding in 1923 among the oaks for which it was named. Several months after the permit was issued, geologists working with Save Buffalo Bayou proved that the entire project, called the Memorial Park Demonstration Project, was based on a faulty analysis. 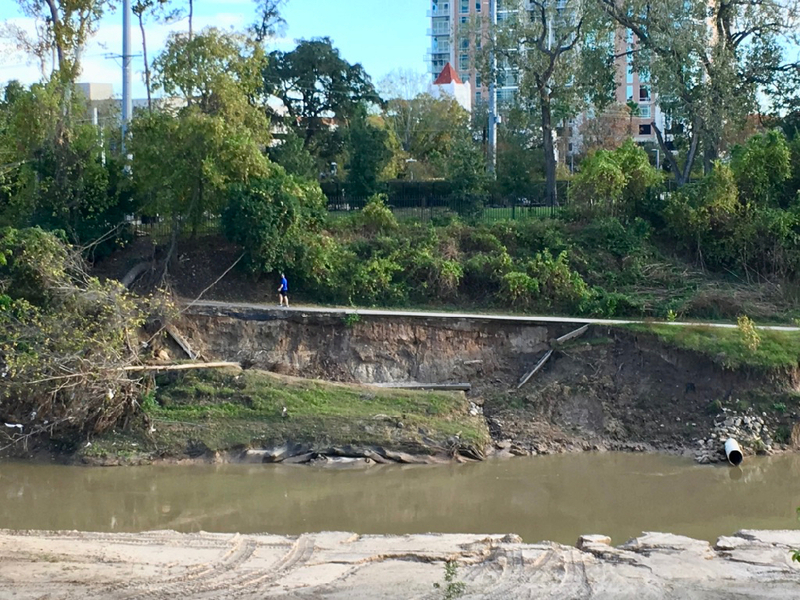 The primary type of bank failure on Buffalo Bayou is slumping, a type of vertical collapse, generally caused by water seeping down and into the bank, for which there is little remedy but to get out of the way, control runoff, stop landscaping and irrigating, etc. The demonstration project was designed for lateral erosion — caused by water flowing downstream parallel to the bank. Its proponents erroneously claimed there was no vertical bank problem on Buffalo Bayou. The project would have failed, leaving behind a tragic and costly wasteland. The misguided Memorial Park Demonstration Project appears to be on the back burner for now. But in the wake of unprecedented flooding from Hurricane Harvey, Buffalo Bayou and all our rivers and streams are more threatened than ever. Flooding begins on the land. But instead of focusing on stopping stormwater runoff before it enters our streams, politicians, engineers, and developer groups are calling for costly and damaging “improvements” to our bayous and expensive engineering and drainage projects that will send more rain runoff even faster into and down our streams. This will only cause more flooding while destroying the natural ecosystem that protects our banks from erosion, and cleanses our water and air. We must now intensify our efforts. Perhaps through the power of our logic and science-based arguments, and the voices of the people of Houston, we can persuade the authorities not to raze the forest and vegetation so vital for cleansing the water, not to drive heavy equipment through the woods and into the channel to dredge, excavate, fill, and reroute the meandering bayou, leveling its high banks, grading its sandy beaches, blocking its springs and tributaries. The shady stretch of the bayou flowing past Memorial Park, as well as many places upstream including Terry Hershey Park, is home to a wide variety of wildlife including beaver and otter and the threatened alligator snapping turtle. But the bayou flowing past Memorial Park is some of our last, best publicly-accessible southern bayou in the city. It’s an outdoor classroom, one of the few places in the city where we can see the geology and natural history of Houston, witness the natural functioning of a living river, and contemplate the serenity of the forest. Containing prehistoric sandstone and high Pleistocene bluffs hundreds of thousands of years old, this is a historic nature area and should be preserved for future generations. Destroying riparian forest buffer, a type of wetland, is a violation of current state and federal land management policy and laws regarding protection of waterways. Our larger focus is to spread awareness and understanding of how rivers work and how they benefit us even in urban areas. We advocate for the protection and restoration of all our bayous and tributaries, as well as the restoration and protection of our wetlands, prairies, trees and forests – our best defense against flooding. Our general mission is to educate the public and our public officials about beneficial land management on our many streams, drawing on the best modern science and the most enlightened practice around the nation and the world. We aim to encourage government agencies to develop enlightened flood and erosion control and drainage policies and practices that respect the natural process of our local bayous and creeks, their floodplains and watersheds, the trees and vegetation growing on their banks that are so vital for the health of our waters, our environment, and us. We support natural or “green” solutions to flooding because they are more effective, cheaper, and better for our health and our environment. Rather than endlessly widening and deepening the channels of our vital waterways, we believe in slowing down, spreading out, and soaking up stormwater before it hits our streams. We also advocate for public access to our public streams. I live on Buffalo Bayou between the Piney Point and San Felipe Bridges. The storm on the night of 5/25/15 raised the level of the bayou about as high as we have seen it in a long time. On 5/26/15 the water started to recede and by 5/29/15 the water level was back down to be close to the normal channel. I inspected our bank and there was no noticeable erosion which is normal for us after storm events. The next week I noticed the bayou was back up with a very strong current. On 6/6/15 I discovered a large area of bank erosion where we lost 3 large trees and 3 smaller ones that fell across the bayou. The property just upstream from us lost a tree from their bank that also fell. I learned that the Army Corp of Engineers, that regulate Addicks Dam had received permission to up their discharge from the dam from a normal maximum of 2,000 cu/ft/sec to 3,000 from 6/1 to 6/11/15. This is what caused my erosion, not the storm of 5/25/15. DID ANYONE ELSE SUFFER SIGNIFICANT EROSION ALONG BUFFALO BAYOU FROM 6/1 to 6/11/15? Thanks for the info, Don. You should also pose this question on our Facebook page if you can. After the storm the Corps was releasing 3,000 cfs for several days, which is possibly an unprecedented amount of flow over an unusually long period of time. We are still looking into that. You probably know that the Corps keeps Addicks and Barker dams at relatively low levels due to fear of failure. Repairs to the dams were scheduled to begin this month. We are looking into the program of dam releases also. We would like to see the dam releases modified to a more naturalistic regime. Here is where you can learn more about the dams, although the Corps does not seem to have updated this page with information about construction. Here is Harris County Flood Control District Director Mike Talbott on June 2, 2015, explaining the high releases to county commissioners’ court.